Health Should we be scared of the norovirus? One moment you’re feeling fine, the next you’re expelling fluids from both ends. A typical friday night, if you are Hunter S. Thompson, but in your case, it is likely that you are a victim of the norovirus, also known as the winter vomiting bug in the UK. As someone who’s lived in Africa and has had his fair share of stomach bugs, I feel your pain. It is one thing to be vomiting or having diarrhea, but doing both at the same time is a very unpleasant experience. What is the norovirus and why do we keep hearing about it? The norovirus is a genus  of viruses which cause about 90% of the gastroenteritis cases in the world. There are a couple of reasons why we keep hearing about it. For you to get the common cold, you need to be exposed to approximately 1000 particles of the virus. In the case of the norovirus as little as 18 . Which means that even the most hygienic person is at risk of infection. Most infections spread from person to person, usually by direct contact or by contact with contaminated surfaces. The virus can also spread aerially. When vomit hits a hard surface (what a pretty image), billion of viruses are suspended in the air, which can then be swallowed or inhaled. It is also extremely resistant. It withstands temperatures of up to 60 degrees centigrade and it is resistant to many chemical detergents. In pooled groundwater it can survive for months and on doorknobs for up to a couple of weeks. These characteristics mean that outbreaks are very rapid, and can cause whole schools or offices to be completely disrupted as most people fall ill.
A dutch study of an outbreak in 2009 estimated that every person infects, on average, another 14 people. Humans easily become immune to some viruses, such as chickenpox or measles, after the first infection. However some viruses, such as the rhinovirus, which causes the common cold, mutate too quickly and any immunity to the old strain becomes useless once the new strain arrives, which is why we keep getting them. The norovirus, however, not only mutates reasonably quickly, but people lose immunity to the same strain only a few months after infection. We still do not know why this is . How do I avoid it then? Always wash your hands with soap and running water, in a pinch one of those hand-wash gels can be useful, but once it evaporates some viruses might still be on your hands, so washing your hands is preferable. If you do get it, stay at home for up to three days after the symptoms have subsided, you are still contagious. And of course, as explained in our video on the common cold, the best way to not get the virus is to avoid contact with other people. Become a hermit and you will definitely not get it. 1. Viruses are divided into family, genus and species by the ICTV (The International Committee on Taxonomy of Viruses). 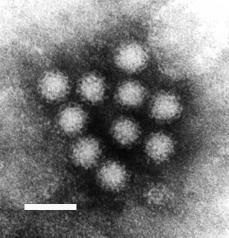 The Norwalk virus (named after a town in Ohio where an outbreak occurred in the 60s) is the only species in the genus norovirus which is part of the family Caliciviridae. 2. Morillo SG, Timenetsky Mdo C (2011). “Norovirus: an overview”. Revista Da Associação Médica Brasileira (1992) 57 (4): 453–8. PMID 21876931..
3. Lindesmith L, Moe C, Lependu J, Frelinger JA, Treanor J, Baric RS (2005). “Cellular and Humoral Immunity following Snow Mountain Virus Challenge“. J. Virol. 79 (5): 2900–9. doi:10.1128/JVI.79.5.2900-2909.2005. PMC 548455. PMID 15709009..